We all know cooking at home is a healthier choice over choosing the drive-thru or dining out. However, it’s important to remember that recipes are created simply for their texture and flavor, but don’t always take health into consideration. To make it easier for you to cook more healthfully, here are a few tips that you can use on a variety of recipes. For many recipes it’s easy to simply reduce the amount of fat or oil used to make cooking easier. Non-stick cookware means you need little or no fat when cooking on the stove top. Greasing baking dishes is often unnecessary as well, but you may have to experiment a little. For fats and oils used for baking cakes and muffins, you can often substitute them with apple puree. For cookies, aim to replace about ½ the oil with puree. You can even aim for a more healthful impact by using highly nutritious sweet potato puree as a fat and oil substitute. If a recipe calls for saturated fats like butter or even lard, replace it with vegetable or olive oil. Of course, this won’t always work in recipes that call for creaming of butter. In those cases, you might try margarine or simply reduce the amount of butter. In baking, you can usually replace 1 egg with 2 egg whites for the same desired result, but with less cholesterol. Try replacing at least half the white flour in a recipe with whole wheat or a gluten free flour that you have experimented with in baking. Many recipes will work with a complete replacement, so experiment a little. Many sweet recipes are sweeter than they need to be. Don’t be shy about reducing the sugars. Definitely do this where sweeteners are often added after cooking. For example, there is no reason pancake or waffle batter needs a lot of sugar when syrup, fruit and other sweet items are added afterwards. To salt or not to salt? In savory foods, salt is usually not necessary. For baked goods, while many may say otherwise, it’s not always necessary either. One exception is baked goods using yeast. Salt slows down the rising process and produces better texture, so it is likely necessary, but you can try reducing the amount of salt used. Try lower fat dairy products in your recipes. Instead of heavy cream, use half and half. Instead of whole or 2% milk, try skim. The same goes for sour cream, yogurt and cheeses. Just make sure to read the label for quality ingredients as lower quality products tend to add undesirable ingredients and chemicals to make their low fat varieties more palatable. Overall, it’s important to try things out. The more you rework recipes and learn from your successes and even the failures, the easier it becomes to modify recipes on the fly. The switch from oils to applesauce/puree is one I’ve heard but haven’t tried yet. Thanks! Those are great tips. 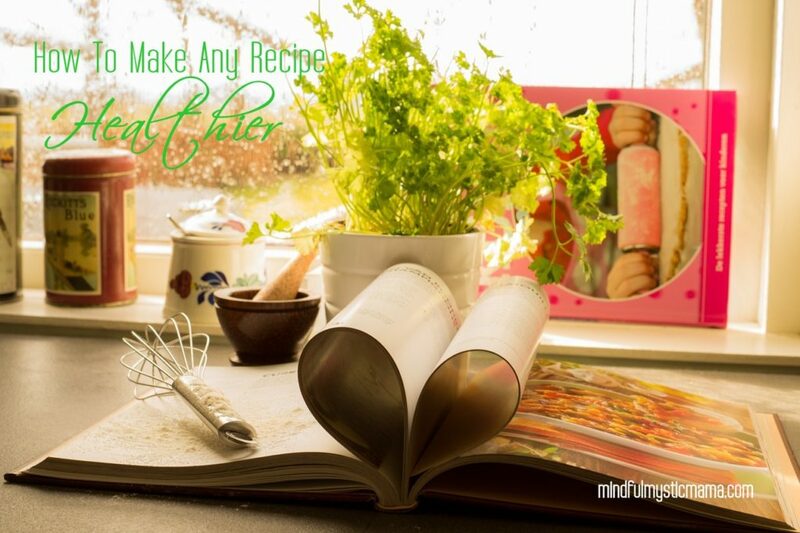 If we make just little changes in the way we cook, we can see huge results. I’m all for making things healthier for my family. But wait – the yolks are the part of the egg WITH the calories. Did you mean you replaced the yolks with the whites? That makes more sense. Haha! Yes madame, you are correct 🙂 Thank you for bringing that to my attention! Great suggestions. We do many of them. Fabulous ideas. We try to replace all the time!! These are great tips – there’s a lot of small things that can add calories to our food without really being worth it in terms of taste, so it’s a big help to substitute and modify! I like to make little swaps. Then I get the things I like to eat, and I do not have to feel bad about it. These are some great ideas. I’m always looking for ways to make recipes healthier. These are definitely some great tips for making a recipe healthier. I’m going to have to start doing the one where you replace an egg with two egg whites. Thanks for sharing these tips! I already do a few. I’m trying to change to applesauce but my family does not like it. I am slowly switching them over so they don’t taste it. Great ideas! We only use coconut oil these days and am amazed at how well everything cooks in it! These are great tips! I need to start cooking healthier! Great Tips For Making A Healthier Meal, I Need To Do This More Often Thank You!! These are great tips. It’s not as hard as people may think to make a recipe healthier and a lot of itme you can’t taste much difference. These are excellent suggestions on how I can improve the healthfulness of a lot of homemade meals. We don’t eat out often or eat too much processed food because of all the additives, but it’s important to remember some of the healthier alternatives I can use when cooking too. Really good to know about replacing white flour with whole wheat! Good tips – it is amazing how we can eat healthier by just switching out a few ingredients. Pinned for a reference for future meal changes. Great tips. We also tend to replace flours whenever we can with different grains or nut flower. Love these great tips. Pinning for future use. Awesome tips- thanks for sharing!! Great tips! I’m a big butter fan and if I don’t use butter, I use coconut oil. I also use honey for sweetener instead of sugar. We are just starting to eat a bit healthier. One step at a time we are making changes. This post helps!